iderdider....: 2: also about 2 1/2. Lately she never stops talking. Yesterday we drove to the Oma's house so that mommy could nap and someone else could take over as Chief Question Answerer. She'll keep asking until someone answers. Even when I couldn't possibly know the answer. It's a little like watching a movie with a certain blond. 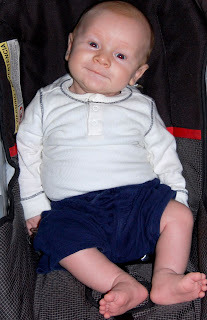 There are wonderful things about you at 2 months: your chubby thighs, sweet breath and smiles. Also awesome: you never, ever ask a question. Your needs read something like this: Milk, cuddle, more milk, diaper please, more milk, thumb, more milk, Weepies CD, more milk. When Claire was tiny, I couldn't wait for her to get big. With you, I know too well how fast this is going to go. How fast it's already gone. When she naps, you sprawl in my arms. I smell your head and enjoy the silence, knowing it won't last long enough. Enjoy this time with Mr. It is true they grow up so fast, and in case you are wondering the questions never stop, they just get more complicated! Oh my gosh, he IS adorable! You know the invite is still open and the guest sheets are clean! already he is getting so big, what a cutie! Oh my goodness he is so perfect. I love the look on his face, and his adorable legs! New baby smell. It's amazing, isn't it? I hope you're enjoying your alone time with Mr. Baby...when you are able to get it. I remember those first months with Makayla. I felt so trapped, so exhausted, yet I took the advice I had recieved: it goes by so fast. Enjoy it. It was hard to do with a non-stop cryer/fusser, but I knew that soon enough that phase would be gone and I would long for tiny baby that fit so perfectly craddled in my arms. And now to do it again...with the addition of a toddler! (But at least we know more of what to do...at least with the baby!) I've heard that the second one seems to grow up faster (sigh)! I can't believe how big he's gotten already! I love you tons and think of you often !